Vim (or "Vi IMproved") is a console-based multi-mode (modal) text editor. It is widely used and available by default on all Unix, Linux, and Apple OS X systems. Vim has a large active community and a wide user base. The editor supports all popular programming languages, and many plugins are available to extend its features. Developers like the editor for its speed, many configuration options, and powerful expression based editing. In "command" mode the editor is controlled by keyboard commands, so the user is not distracted by a GUI or mouse pointer. Vim is based on the earlier Unix "vi" editor created in the seventies and it has been in continuous development since 1991. With macros and plugins the editor offers most of the features of a modern IDE. It is also uniquely capable of processing large amounts of text with its scripting language (vimscript) and regular expressions. Run interactive vim tutorials as many times as needed to feel comfortable with the basics. Vim features several modes, e.g. normal mode, insert mode and command-line mode. Normal mode is for editing and navigating text. In this mode h , j , k and l correspond to the cursor keys ← , ↓ , ↑ and → . Most commands in normal mode can be prefixed with a "count", e.g. 3j moves down 3 lines. Insert mode is for inserting the text directly, in this mode vim is similar to other more simple text editors. To enter insert mode press i in normal mode. To leave it press <ESC> (escape key). Command-line mode is for running more complex commands like saving the file and exiting vim. Press : to start the command-line mode. To leave this mode you can also press <ESC> . To save the changes to the file use :w (or :write ). To exit vim without saving your changes use :q! (or :quit! ). r replace – enters replace mode for one character. The next character you type will replace the character under the cursor. R enters replace mode indefinitely. Every character you type will replace the character under the cursor and advance the cursor by one. In order to exit Vim, first make sure you are in Normal mode by pressing Esc. The : keystroke actually opens Command mode. The command q is an abbreviation of quit , w , of write and x , of exit (you can also type :quit , :write and :exit if you want). Shortcuts not starting with : such as ZZ and ZQ refer to Normal mode key mappings. You can think of them as shortcuts. The ! keystroke is sometimes used at the end of a command to force its execution, which allows to discard changes in the case of :q! . Placing the ! at the beginning of the command has a different meaning. For example, one can mistype :!q instead of :q! and vim would terminate with a 127 error. An easy way to remember this is to think of ! as a way of insisting on executing something. Just like when you write: "I want to quit!" The Vim on your machine—if there is one—is very likely to be a "small" build that lacks useful features like clipboard support, syntax highlighting or even the ability to use plugins. This is not a problem if all you need is a quick way to edit config files but you will soon hit a number of walls if you intend to make Vim your main editor. It is therefore generally recommended to install a complete build. On those systems, the trick is simply to install the GUI version which comes with both a gvim command for starting the GUI and a vim command for starting the TUI. issue $ mvim -v in the shell to open the MacVim TUI. Download and install an official snapshot like you would with any other Mac OS X application. Place the mvim script that comes bundled with MacVim somewhere in your $PATH . There is no Vim on Windows systems by default. You can download and install Vim from the Tuxproject site for more up-to-date and complete builds or you can download and install Vim from the official Vim site. If the methods above don't suit your needs it is still possible to build Vim yourself, with only the options you need. This topic will be discussed in its own section (currently in draft). vimtutor is an interactive tutorial covering the most basic aspects of text editing. On Windows, “Vim tutor” can be found in the “Vim 7.x” directory under “All Programs” in the Windows menu. See :help vimtutor for further details. Vim Adventures – An interactive game version of vimtutor available on the web. Only the first few levels are free. 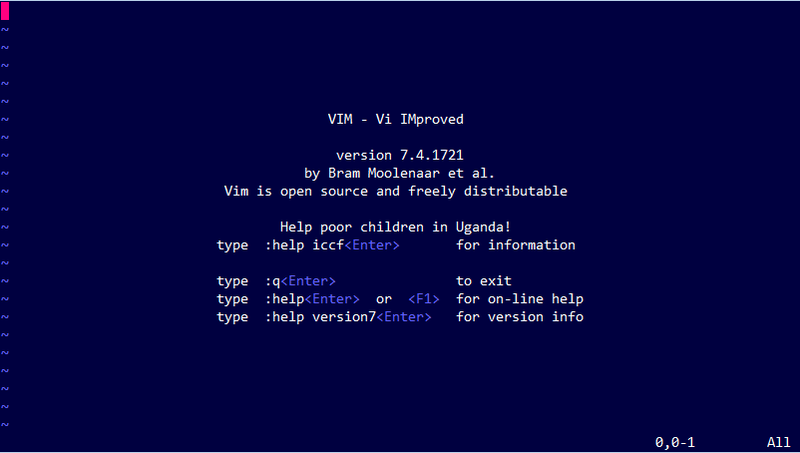 Open Vim – An interactive terminal which teaches you the basic commands with feedback. Vim Genius – Another interactive terminal which also includes intermediate and advanced lessons including macros and arglist. Sometimes, we may open a file which we do not have permission to write in Vim without using sudo . Use this command to save a read-only file edited in Vim. You will be presented a prompt as shown in the image. Press O and the file will be saved. It remains open in vi/vim for more editing or reading and you can exit normally by typing :q! since the file is still open as read-only. When using vim from the command line, you can suspend vim and get back to your prompt, without actually quitting vim . Hence you will later be able to get back your vim session from the same prompt. Alternatively, on some systems, when in Normal or Visual mode, issuing Ctrl+Z will have the same effect. Note: If autowrite is set, buffers with changes and filenames will be written out. Add a ! before enter to avoid, eg. :st! enter. Later, when you want to return to your vim session, if you haven't suspended any other jobs, issuing the following will restore vim as your foreground job. Otherwise you will need to find your vim sessions's job ID by issuing jobs enter and then foregrounding the matching jobs fg %[job ID] enter eg. fg %1 enter. Vim saves all your unsaved edits in a swap file, an extra file that gets deleted once the changes are committed by saving. The name of the swap file is usually the name of the file being edited preceded by a . and with a .swp suffix (you can see it with :sw ). to recover the uncommitted changes. Found a swap file by the name ".myFile.swp"
Swap file ".myFile.swp" already exists! If you choose (R)ecover then the changes from the swp file are applied but the swap file won't be deleted, so don't forget to delete the swap file afterwards if you're satisfied with the recovery.